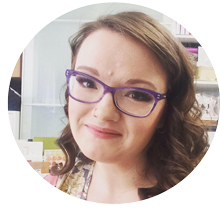 It's that time again - time for the Papertrey Senior Design Team gals to get together and participate in a challenge issued to us by Nichole! This month's challenge was to do something with a resist technique - whether it be an old technique or something completely new. 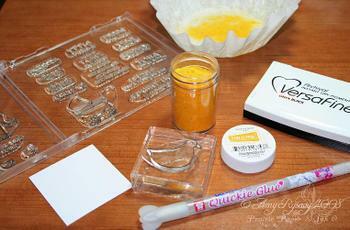 I chose to do the clear emboss resist - so simple yet it has such a cool look to it! I chose the Women of Life set for my project, and stamped the cluster flower stamp onto PT white cardstock with VersaMark then embossed them with clear embossing powder. 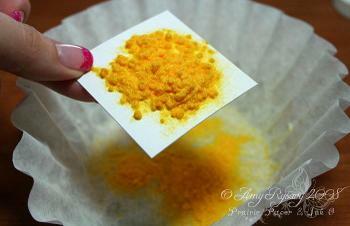 I then pulled out my Lavender Moon ink pad and a sponge dauber and sponged ink over the flowers. 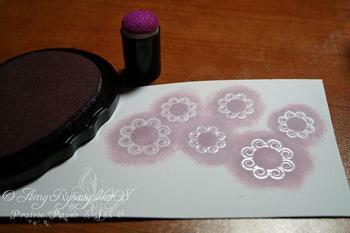 The clear embossing powder resists the ink so that the flowers "pop" and appear white (this is a great technique if you want to use multiple colors of ink - for my project I wanted to stick with just the one color). 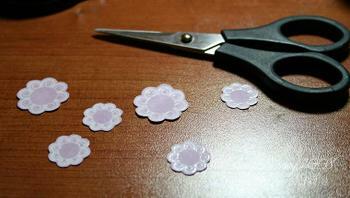 I used a sharp pair of detail scissors (these ones are from Stampin' Up!) to cut out the flowers leaving a small border around each one. 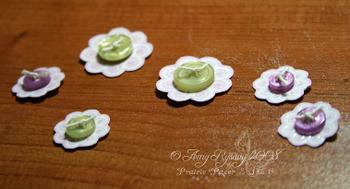 To finish off each flower I added buttons sewed on with string. And here's my finished card! I stamped the stems onto PT Aqua Mist CS using Spring Moss ink (I purposely stamped them more to the left for visual interest). The sentiment is also from the Women of Life set - I omitted the dots when I inked it up. The green "strip" is actually Spring Moss twill ribbon - it didn't show up well in this photo. STAMPS: Women of Life Set by Papertrey Ink. CS: Papertrey Stamper's Select White, Aqua Mist, Spring Moss, Black (SU!). INK: Lavender Moon, Spring Moss, Black, VersaMark. ACCESSORIES: Clear EP, Buttons, String, Dimensionals, Spring Moss Twill, Lavender Moon Dotted Ribbon, Corner Rounder Punch. 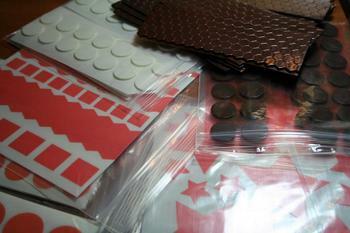 My package arrived from Jody containing all my fabulous adhesive goodies - thanks Jody! 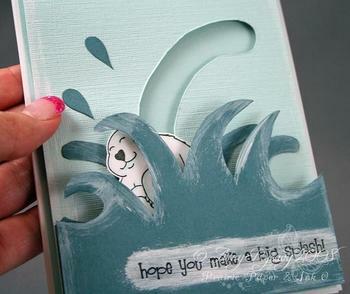 My Make a Big Splash card was the card of the week over at CardOfTheWeek.com - very cool. 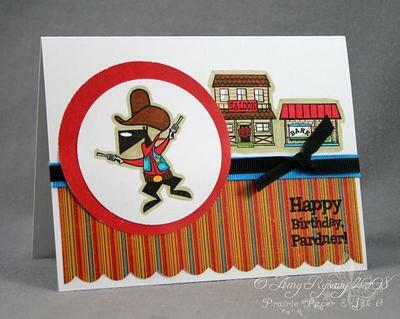 Side note: I am planning on having a "round up" of sorts or a feature post where I will post links and/or pics with links to everyone's creations when they play along with my card sketches. I love to see what everyone comes up with and I want all my other readers to be able to easily see them too! That has been on my mind for a while so hopefully I can start doing that SOON!! The CC Designs new stamps preview has started over on the ATS blog - check them out! You can also win FREE stamps so head over there now! The new stamps are SUPER cute - can't wait for mine to get here! Here's the sketch real quick for now. I'll be back later today to edit this post and add my samples. My headache lasted most of the day and finally went away in the late afternoon then came back after my *wonderful* neighbor thought it'd be fun to rev the engine of something for over 1/2 an hour so loudly that the noise brought it all back!!! Anywho the keyword for this sketch is AMYRS27 - can't wait to see what y'all do with it! OK it's later (lots later than I planned) but here's a couple of samples for y'all!! Sorry my pics aren't that great - this week has been insane for me and now that it's almost over it seems like everything that can go wrong IS!!! So I don't have time to re-take the pics but I hope y'all like them anyway! 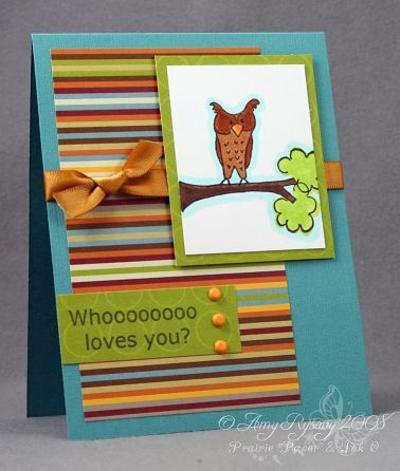 Both samples were made with CC Designs A Hootin' Good Time stamp set (yup OWLS!! This set is adorable me thinks....) and all the supplies for both cards can be seen here (scroll past all the fabulous samples - which were also made with the same supplies - to see the actual paper and brads and whatnot). I used Copic markers to color in the images, pieced together my cards and that was it! Have a fabulous weekend everyone and I am going now to pray that it gets here QUICKLY!!!! Hey everyone. I am so glad y'all seem to like my previous card as much as I did. I read every comment and they sure made my day. I have a splitting headache (woke up with one and it just won't go away) so this post is going to be short and sweet. 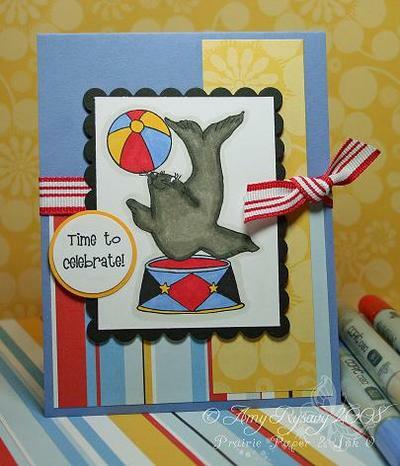 I saw a scrapbook page online some time ago (sadly I can't remember where) that inspired this card. 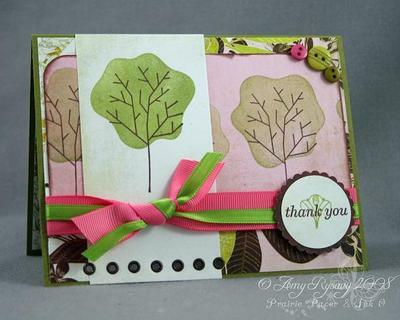 Stamps are from the In The Treetop set by Lizzie Anne Designs. Buttons were attached with mini glue dots, and the ribbon was attached by punching holes in the paper (the Prima flowers hide the holes), threading the ribbon through then tying in a knot to mke stems and leaves. Have a happy Thursday everyone - I'm off to take some more Tylenol! OK I am REALLY proud of myself right now - an idea popped in my head when I was looking at Melanie's new Jumping For Joy set and I was actually able to execute it EXACTLY how imagined it!!! *hugs self* LOL!! I stamped the bear, used a little Cool Shadow Copic marker on him to make him look MORE white, then cut him out. I used 2 pennies and a dimensional to make him into a spinner. 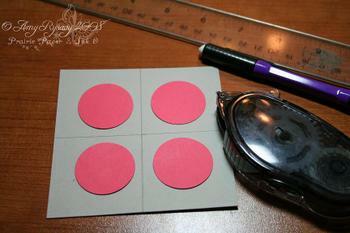 You can check out a tutorial on SCS here that shows you how to make a spinner card. For this card I just used a pencil to mark the "track" for the bear, then cut it out with my craft knife (I used Soft Sky SU! textured cardstock for that). 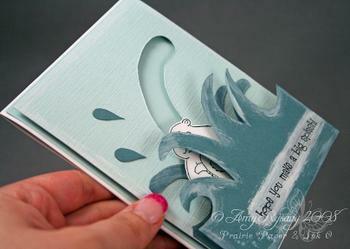 The "water" was made with Blue Bayou CS - I drew the "splashes" on 2 separate pieces with a pencil then cut them out. All the white was made with a Ranger Snow Cap (white) paint dauber. This card is REALLY thick (about 1/2"!) as the textured CS is also up on dimensionals so that the bear spins freely on the track. 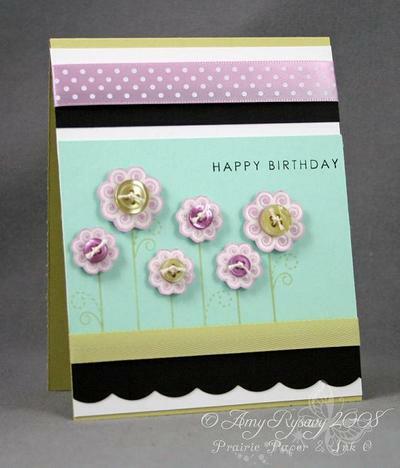 Two of my recent tutorials were featured on Cardoftheweek.com - you can check out the post here. Thanks Susanna! 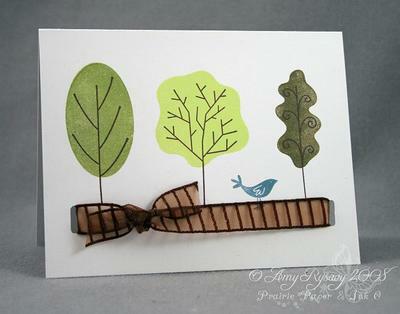 It is DEFINITELY time to celebrate as I got my newest GinaK stamps in the mail yesterday! I lost no time getting them cut out and started making samples and here's the first one! All images are from Melanie's new Jumping For Joy stamp set - I stmaped them onto Papertrey White CS and colored them with my Copics. The patterned paper is from Autumn Leaves - their primary line, and the colored CS is SU (as is the ribbon). OK I gotta run as I have a TON of things I need to get done today! Anywho this card features presentahbella - I stamped her onto white cardstock then colored her in with Copic markers. I then used Stickles here and there on the image for some bling. The sentiment is from A Muse (yet again too perfect for this stamp!). The diecut CS is KI Memories Lace CS - I am REALLY liking this stuff - it just adds an extra WOW to a card (and you can see I put a bit of it on the inside of the card to dress it up a bit). I finished off the card with some Papertrey Lemon Tart grosgrain ribbon, a mondo Prima Flower (the green plastic center I had in my stash - not sure who makes it but I do remember that Lauren sent it to me along with a bunch of other goodies!) attached with a white brad and that's it! SUPER quick, simple card. I stamped the images using VersaMagic inks, punched 2 holes in the card and ran the ribbon through (the ribbon I got from Michaels months ago). 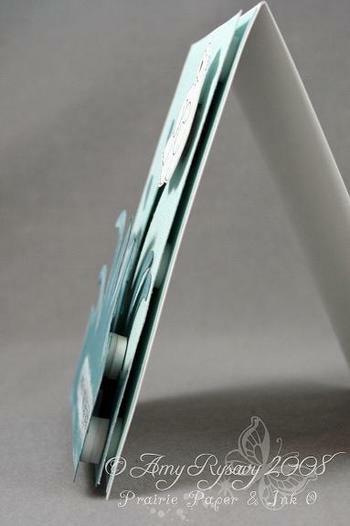 Card base is Papertrey white CS. Same inks used for this one as well, except I used all patterned papers from Basic Grey's Sultry line. The sentiment and the image behind it are from Papertrey's Simple Little Things set (which sadly you can't buy - you had to earn it - more deets on that here). The buttons are also Basic Grey, and I used my Crop-a-dile with some Making Memories eyelets to add some interest along the bottom of the card. 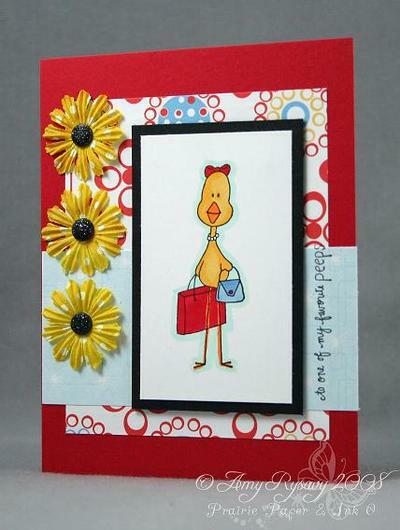 I used CC Designs Hey Chicky stamp set - stamped the chick then colored her in with Copic markers (the one I used to outline is the Cool Shadow BG10 marker - I use that one a lot). The sentiment is from A Muse (too perfect for this set!). The patterned paper (which inspired the colors of my card) is Autumn Leaves MOD paper - the Primary collection (I LOVE this paper - it is SO bright and cheerful - perfect for summer!). I added some Prima Esprites and used black glitter dots for the flower centers (attached with mini glue dots) and that was it - easy peasy!! If you upload your card using this sketch to any public galleries please use the keyword AMYRS26 to make it easier to find. I don't know about the rest of you but lately it seems like I am surrounded by pregnant women and new babies!! I am constantly in need of baby cards (not just for me as I get requests from people who would rather give a handmade card than buy one at the store) and baby gift ideas - and as time for me is usually limited I want my cards to be cute yet simple at the same time. 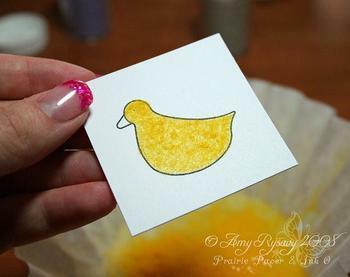 I started with some Sunshiny Yellow Fun Flock (by Stampendous, there is also a line of DoodleBug flock that's great too) that is a GREAT match to Papertrey's Summer Sunrise color, black ink, the Bitty Baby Blessings Stamp set, and some liquid adhesive. 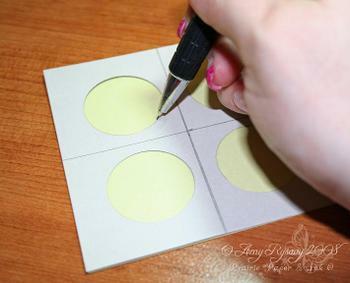 I generally use one of three different glues when applying Fun Flock - the Quickie Glue pen by Sakura (great for small areas and detail work), Tombow Mono Multi (my go-to adhesive for everything), or the 2-Way Glue Pen from Stampin' Up! (I like it's thinner consistency and that it goes on blue but dries clear - FYI I used this adhesive for applying the flock on this card). 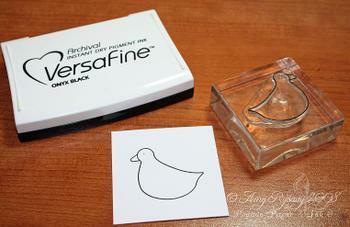 I started by stamping the duck image onto Papertrey white cardstock with black ink. I then filled in the image with the 2-Way glue pen. I immediately dumped a liberal amount of flock over the image (I use coffee filters to catch the extra flock and funnel it back into the container. 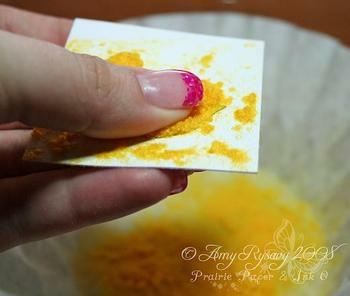 I re-use the filters over and over again with the same colors - this works great for glitter and embossing powder too!). Before tapping off the excess flock I PRESS all over the image to make as much flock adhere as possible (this step is important as I find that if you DON'T press the flock on not much will stick!). And that's it! Fun Flock is EASY to use and adds such a fun texture to a project and is GREAT for anything baby-related - who can resist that fuzzy texture? And since I know I will be asked no the flock doesn't come off later on - you can touch it and rub your finger over the image and hardly any comes off (a good thing since the recipient and anyone else who sees the card will instantly want to touch it!). I finished off the main image by coloring the duck's bill with a copic marker and outlining the image with another marker. The scalloped mat was made from Summer Sunrise CS and a scalloped square Nestabilities die, then I added some patterned paper from the Father Knows Best 6x6 collection and a piece of Lemon Tart CS. The sentiment is from the Bitty Baby Blessings set. For a little bonus here are 2 more cards I made using other images from the Bitty Baby Blessings stamp set. 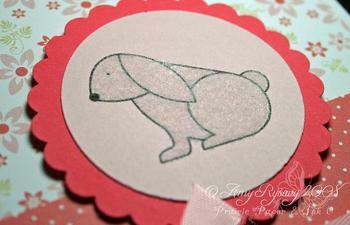 On this one I used the bunny image, stamped it onto PT's Sweet Blush CS, then filled it in with white Fun Flock. 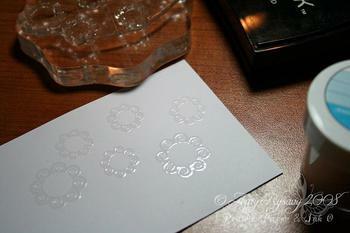 White flock tends to be more "transparent" so whatever color the image is stamped on shows through easily. For this one I used 2 different colors - Hazy Grey and Lavish Lilac - I stamped the elephant then applied glue to only the ear - applied the grey flock, pressed and tapped it off, then applied glue to the rest of the body and applied the lilac flock. And here's the full set! 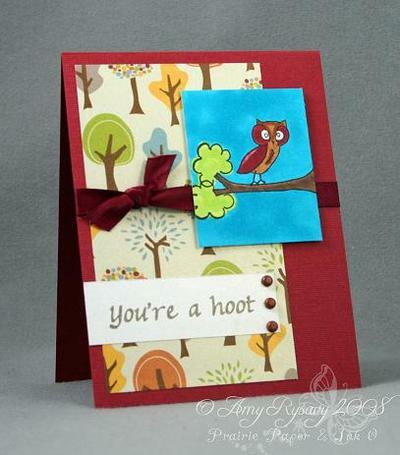 All three cards were pretty quick and easy but the added texture of the flock gives them all that extra "wow" factor. I hope y'all like them!! 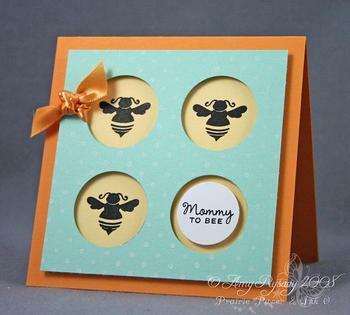 STAMPS: Bitty Baby Blessings Stamp Set. CS: Papertrey Stamper's Select White, Summer Sunrise, Lemon Tart, Father Knows Best 6x6 Patterned Paper. ACCESSORIES: Fun Flock, Summer Sunrise Swiss Dot Ribbon, Nestabilities Die, Dimensionals, Corner Rounder Punch. CS: Papertrey Stamper's Select White, Sweet Blush, Berry Sorbet, Pink Patterns 6x6 Patterned Paper. ACCESSORIES: Fun Flock, Marvy Punches, Sweet Blush Twill Ribbon, Dimensionals. CS: Papertrey Stamper's Select White, Going Grey (SU! 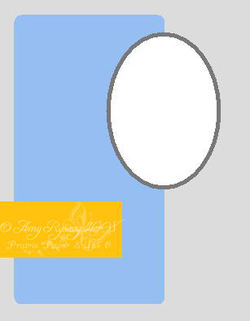 ), Bitty Baby Blessings 6x6 Patterned Paper. 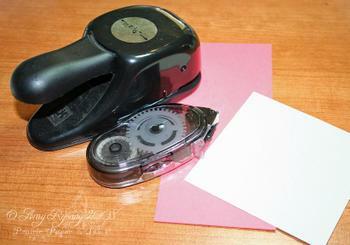 ACCESSORIES: Fun Flock, May Arts Ribbon, Corner Rounder Punch, Brads, Sewing Machine, Dimensionals. Just a quick card to share with y'all this morning as I have a TON of things to do today - as well as my first (of many) dentist appointment in the city this afternoon - blah. This card uses stamps from The Cat's Pajamas It's a Western Thing clear set, and I used Copic markers to color them all in. The patterned paper is from daisyd's Autumn collection. 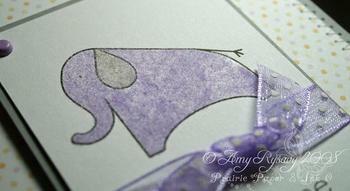 I used a corner rounder punch to make the scalloped edge - you can see the tutorial on that here. Quite a mouthful for a title but I didn't know what else to call it! 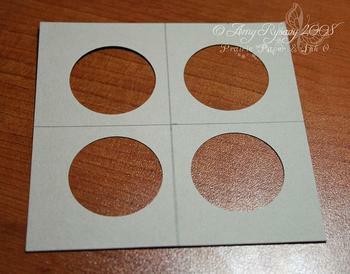 To get the 4 circles lined up perfectly I use this chipboard piece from one of Stampin' Up! 's On Board chipboard sets (the name of the specific set escapes me at the moment!). You need either a piece of cardstock or some cardboard backing (like on the back of a pad of paper) - I just used CS for this - cut to 3 3/4" square. 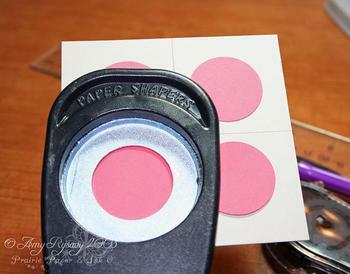 You also need some scrap CS, a 1 1/4" Circle punch (you can use whatever size you want for the circles - doesn't HAVE to be this specific size), some adhesive and a pencil and ruler will help too. 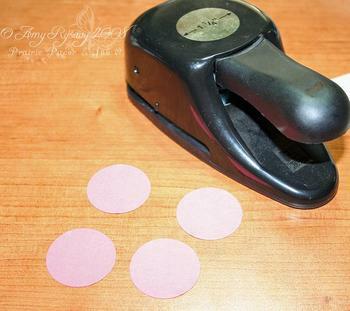 Begin by punching out 4 circles from the scrap CS. Then you need to adhere them to the 3 3/4" square CS. It helps to use a ruler and mark the center of the CS (which FYI on a 3 3/4" square is 1 7/8") to be able to line up the circles better. Then I just eyeball them and adjust if I need to. 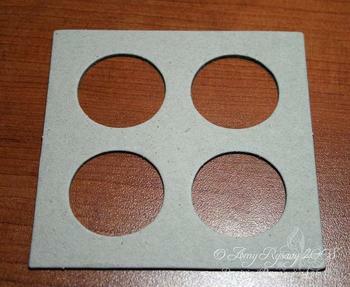 Then you take your circle punch and punch through the square of CS by placing it directly over the circle you adhered to it. 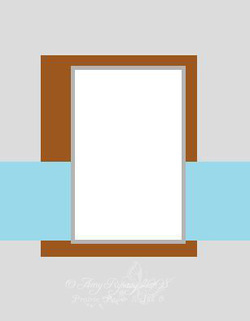 Now you've got your template! 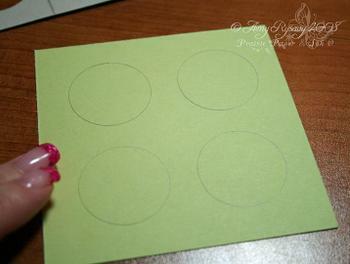 So to use it you place it over the CS you want on your card, then trace the circles with a pencil. And there you have it! 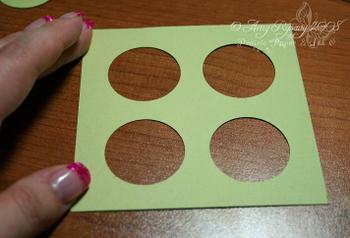 Once you have your template it takes seconds to trace it out and punch the holes - SUPER quick and easy! I hope y'all enjoyed this and post a link to your creation on this post if you make your own template and cards!! 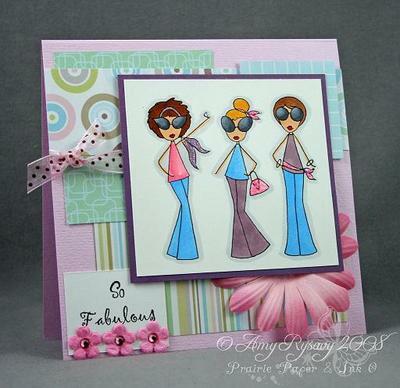 I am LOVING CC Designs new Glam Girls set - I think these gals are just too cute LOL! I stamped all 3 of them onto Bazzill Smoothies cardstock then colored them in with my Copic markers. I added a bit of stickles to each one as well (they HAD to have some bling!). FYI this card measures 6x6" square.